Why does silence and quiet make us so afraid? Why do we drown out the stillness with all our electronic gadgets? Why do we feel so awkward during a still moment during a Sunday morning service of worship? Could it be that we are afraid that God might actually speak? Are we nervous about what he might say to us? What issues he might correct in our hearts? What commands he might give? Are we concerned that he might embarrass us with an outpouring of his love? Silence has long been a characteristic of the Church’s worship. Leaving room in a service of worship for God to speak personally and corporately should be the goal of every worship leader. The pregnant pause in a worship service could be the very moment the Holy Spirit comes in power. Some of our services are far too formal, respectable and dull. At the same time, in some modern meetings the almost total loss of the dimension of reverence disturbs me. It seems to be assumed by some that the chief evidence of the presence of the Holy Spirit is noise. 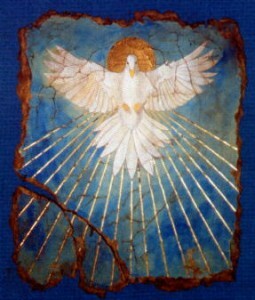 Have we forgotten that a dove is as much an emblem of the Holy Spirit as are wind and fire? When he visits his people in power, he sometimes brings quietness, silence, reverence and awe. His still small voice is heard. Men bow down in wonder before the majesty of the living God and worship. ‘The Lord is in his holy temple; let all the earth keep silence before him’ (Hab. 2:20). John Stott, Balanced Christianity (London: Hodder and Stoughton, 1975), 39. This entry was posted in Holy Spirit, John Stott, Worship and tagged Holy Spirit, John Stott, Worship on May 30, 2009 by GlennDavis.